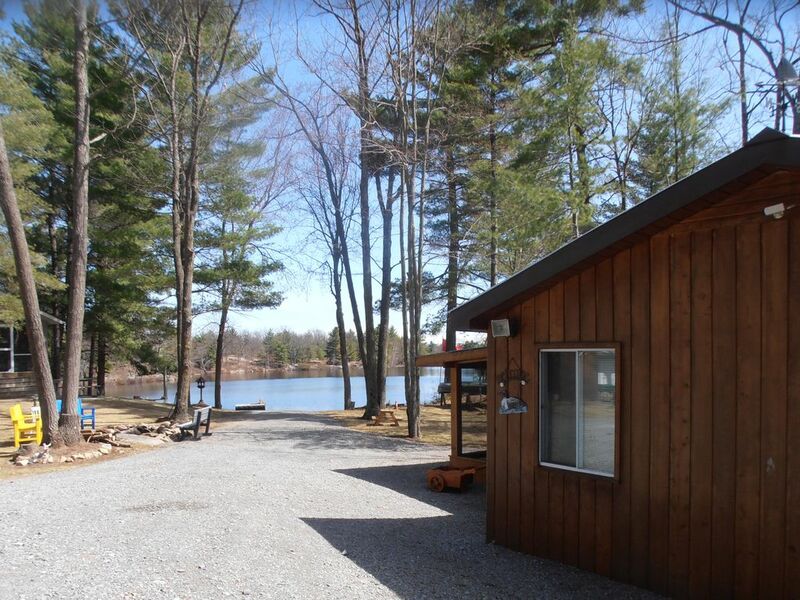 Cabine Waterfront - Lac tranquille avec plage privée - Semaines se remplissent rapidement! C'est l'endroit idéal pour passer du temps en été. Le magazine Narcity nous a classé parmi les 14 meilleures cabanes confortables de l'Ontario pour la valeur locative. Venez profiter de la belle baignade et vous détendre sur la plage de sable. Notre cabine à aire ouverte comprend une cuisine entièrement équipée, de l'eau filtrée aux ultraviolets, une télévision par satellite, une véranda avec moustiquaire, pour 1 à 6 personnes. Les installations comprennent douche extérieure h / w, barbecue, foyer, radeau de natation, fosses de fer à cheval, l'utilisation de 2 canoës, lancement de bateau et d'amarrage. Bonne pêche. Nice, propre et bien entretenu chalet et propriété. Situé à environ 2 heures d'Ottawa, à 3 heures de Toronto, à 1 heure et demie de la frontière américaine et à 45 minutes de Kingston. Seulement 20 minutes en voiture de Vérone qui a épicerie, LCBO, etc. Location à la semaine du dimanche @ 15:00 au dimanche à 11 heures. S'il vous plaît noter - messages VRBO prix de location en USD, cliquez sur l'onglet taux et utiliser la conversion icône de monnaie pour voir les tarifs canadiens. This is our second time staying at this cabin and it's been perfect both times. We've enjoyed the fishing, canoeing, and swimming along with quiet time to rejuvinate. We have ventured in to town (Verona) to golf and to Kingston to ride our bikes along the lakeshore and to explore Old Fort Henry. Life sure is better at the lake!!! Me, my husband and our 17 month old son Elijah made the trek from the Niagara region to spend a week on the water in this cozy and cute cabin. We were greeted by our wonderful hosts and given a tour of the property which was absolutely beautiful. During our week stay we got quite a bit of rain but we didn't spend a moment being bored; there was satellite TV, board games, a ping pong table and many other activities to make the time pass. So peaceful to wake up to the sound of loons out on the lake and see the water right from your bed and even spend time reading in the hammock by the water and listening to the sounds of nature. We have decided to make this cabin our annual family vacation and look forward to returning next year...we will have lots of good memories for many years to come!!! What a wonderful, peaceful cottage where you can just get away from it all. We loved our stay, 2 adults and two boys (11 and 8). Al and Simone have made a welcoming place for families. You see their heart in the care of the property, their respect for the nature around them and in their friendliness with their guests. We loved the swimming, the fishing, the canoeing..all on a peaceful, private lake...we could hardly believe it was end of July b/c the lake was so quiet. It was a great place to reconnect as a family, as there are no distractions and disruptions. The cottage was cozy and warm, and sound proof so good for an afternoon nap while dad kept kids busy. Well stocked kitchen and screened in porch for dining pleasure. The outdoor shower was very cool and the outhouse...you could sit and read the paper if you needed to..was well kept. It was better than the picture because of the feel of the place cannot be captured. Thank you for such a wonderful time. For those who may need a bit of night life and partying, it may not be the place for you... the only show you will see is the amazing stars, the sound of loons calling, chipmunks scampering and crickets chirping. 20 minutes en voiture dans Vérone, épicerie, quincaillerie, magasins locaux, bière / liqueur, gaz, etc. De nombreux invités ont visité le pénitencier de Kingston en 2017 et ont vraiment apprécié. Les billets sont disponibles pour 2018. Terrain de golf à proximité. Zone de conservation des lacs de dépôt à proximité pour la randonnée. You will need to bring your own linens, blankets, towels, toilet paper etc. You will be expected to take your garbage home with you. The cottage has a barbecue with side burner, including propane, coffee maker, pots, pans, plates and utensils etc. Hot and cold running water. The water is tested regularly but most people bring their own drinking water due to the different tastes from area to area.